Many people find it impossible to sleep at night without snoring. A variety of different issues can result in snoring. This includes allergies, colds, obstructive sleep apnea, and even the position you sleep in. Problem snoring can cause serious issues for some people in terms of getting proper sleep. It can also have a negative effect on anyone else sharing the same room. If you experience regular problems with snoring, there are various snoring aids you can try. Many of these are inexpensive products that can prove useful in terms of reducing this problem. Two of the commonly-used products on the market are nasal dilators and nasal sprays. Nasal dilators provide a popular and straightforward snoring solution. They are designed to help open up the nasal passages to aid your breathing. 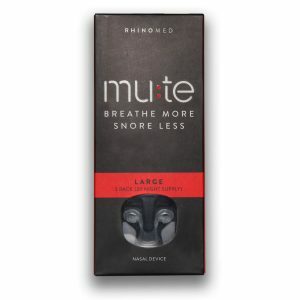 This helps to reduce problems with snoring caused by blockages and congestion. Your nostrils can collapse onto themselves, which also affects your breathing while you sleep. Again, this is an issue that can be addressed with the use of nasal dilators. These dilators can be inserted easily into the nostrils. They are usually made out of metal, plastic or rubber. Once the dilator has been inserted, it will keep the nasal passage open through the night. Although you can feel the dilators when you have them in, most people do not experience discomfort from using them. It is important to bear in mind these dilators come with pros and cons. By weighing these up, you can work out whether this is a suitable snoring solution for you. What Are the Pros of Nasal Dilators? Nasal dilators are an affordable solution for those with snoring issues. Dilators can effectively help with breathing by opening the nasal passages. You can choose from different sizes to suit your needs. You should find that nasal dilators cause little to no discomfort. They are quick and simple to insert into the nostrils. They can be re-used so you don’t have to replace them regularly. What Are the Cons of Nasal Dilators? These dilators will only help with certain causes of snoring. When you have them inserted it is noticeable. If you have smaller nostrils, you may find them a little uncomfortable. By taking these pros and cons into consideration, you can quickly determine whether nasal dilators are the right snoring aid for you. If you are looking for an alternative to nasal dilators, you can try a nasal spray. Unlike many other snoring products, using a spray doesn’t involve having to wear anything while you sleep. This is why many people opt for a spray rather than products such as nasal strips or dilators. Using a nasal spray to deal with your snoring will enable you to benefit from ease and convenience. All you need do is apply the spray to the back of your throat before you go to bed. Once you have applied the spray, you can look forward to a better night’s sleep. However, do remember the effectiveness of these products can vary from one person to another. Nasal sprays work by clearing the nasal passages, removing blockages, and draining or drying the mucous that can cause congestion. They also help to clear the air passages at the back of the throat. These can become blocked as a result of soft palate tissue collapsing while you are sleeping. To enable you to make an informed decision, you need to look at the pros and cons associated with nasal sprays. What Are the Pros of Nasal Sprays? They can be applied with speed and ease. These sprays can help to clear both nasal passages and air passages at the back of the throat. Many sprays are inexpensive to purchase. You don’t have to wear anything to help with snoring when you use a spray. What Are the Cons of Nasal Sprays? The effectiveness of sprays can vary from one person to another. You will have to purchase them on a regular basis for continued use. Some nasal sprays may result in various side-effects. With regards to side-effects, you should always read the leaflet or the box the spray comes in so you can learn more about any possible adverse effects. You may find it difficult to work out which of these two snoring solutions is going to best suited to your needs. While both can be very effective for some people, you do need to determine which of them is most likely to suit you. With snoring solutions such as these, it is often a case of trying it out for a week or two to determine its effectiveness. You can also look at some key points to help you reach a decision. When it comes to cost, both of these solutions are pretty inexpensive. You do need to remember, however, that you will need to buy the nasal spray regularly if you plan to use it continuously. With nasal dilators, you can reuse the same ones, which means no regular purchasing is involved. This can therefore work out cheaper in the long-run. Another important consideration is potential side-effects. There are no side-effects associated with nasal dilators other than a little discomfort for some people. Some nasal sprays, on the other hand, can result in various side-effects. This is why you need to read the enclosed leaflet before you use the spray. A plus-point for nasal sprays is that you won’t have to wear anything to help with your snoring. All you have to do is apply the spray to the back of the throat before you go to sleep. With dilators, you have to insert them into your nostrils and wear them through the night. However, some people do not like using products containing chemicals and may therefore prefer the dilators. If you want a snoring solution that is quick and simple to use, both of these options will fit the bill. They are also both available at a reasonable cost, although the spray will involve more regular purchases. You may find you need to try out either the dilators or the spray for a short period to see whether it is effective for you. If it proves ineffective you can look at trying out an alternative solution to help reduce or stop your snoring.